The HSE has said it regrets any delays experienced by patients. THIS MONTH HAS been the worst August on record for hospital overcrowding, the Irish Nurses and Midwives Organisation (INMO) has said. The INMO’s monthly ‘trolley watch’ analysis shows that 7,911 admitted patients had to wait on chairs or trolleys in August 2018 – an increase of 2% on the same month last year. Some 30 children were among those waiting without a bed, the organisation said. A full breakdown of the numbers can be read here. Speaking about the figures, INMO General Secretary Phil Ni Sheaghdha said: “Even though it was a mild month, patients and staff faced record overcrowding. Nearly 8,000 sick and injured people were forced to wait without a bed. The message from the frontline is clear: this all comes down to pay. The HSE simply cannot find enough nurses and midwives to work on these wages. It’s no coincidence that Limerick has had such a bad month, as they have over 70 unfilled nursing vacancies. The INMO will meet the HSE and the Department of Health at the Workplace Relations Commission next week to discuss understaffing and overcrowding ahead of the upcoming winters season. A spokesperson for the HSE said the organisation regrets any delays experienced by patients. 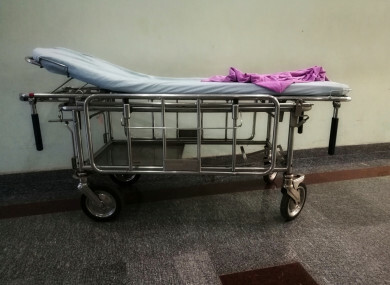 In a statement, they said: “Hospitals are continuing to implement measures so that patients can transfer to wards and hospital beds as quickly as possible. These measures include the opening of additional beds (surge capacity), a greater focus on discharging patients to appropriate care as well as speedier access to diagnostic and other tests that mean patients can be discharged more promptly, and the curtailment of elective admissions as necessary. The spokesperson added that “a key additional challenge” facing hospitals is the number of older patients presenting to EDs. Typically patients over 75 years have more complex care requirements and are more likely to need to be admitted to hospital for treatment and will have longer lengths of stay. So far this year ED attendances are up by 3.2% compared to the same period last year. 2017 and 2016 also saw increases in ED attendances. In the year to date up to the end of June the number of ED attendances by people aged 75 years or older increased by over 5% . Email “'Worst August on record' for hospital overcrowding with almost 8,000 on trolleys ”. Feedback on “'Worst August on record' for hospital overcrowding with almost 8,000 on trolleys ”.